Save 25% when you buy the set! 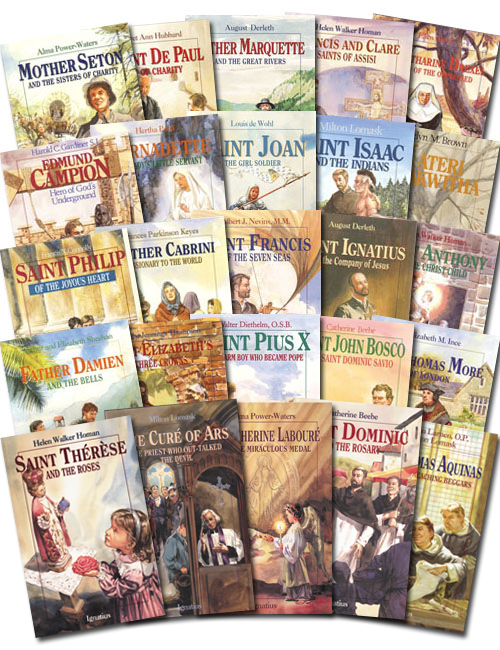 br/> These popular children's books present the lives of the saints in a clearly written format that appeals to today's young people. Each book is rich in historical context, introducing the events that shaped the saint's life. All books contain black and white illustrations. This set includes: The Cure of Ars, Saint Therese, Father Marquette, Saint Dominic, Kateri Tekakwitha, Saint Catherine Laboure, Saint John Bosco, Saint Pius X, Saint Elizabeth, Father Damien, Saint Philip, Mother Cabrini, Saint Francis Xavier, Saint Ignatius, Saint Thomas More, Saint Isaac, Saint Anthony, Edmund Campion, Bernadette, Saint Joan, Francis and Clare, Mother Seton, Vincent De Paul, Katharine Drexel, and Thomas Aquinas. This set is great for children in grades 4 though 8. I have 2 daughters- 8 and 10- who were becoming bored with history and religion as I was presenting it to them. We switched to a read out loud format using these books and they voted to continue. I pull in material from science, history and religion. They are so entertained that they don't realise they are learning. Example: When reading about Mother Seton they learned about yellow fever, TB, how travel took place in the early 1800s, anti-Catholic prejudice in areas of the United States. (I showed them political cartoons of the time that showed American children shrinking in fear as Pope like creatures modeled to resemble alligators tried to devour them) Anything that they want to pull up as a side track when we are reading is easily found on the internet in minutes. We are reading Kateri Tekakwitha now and will follow with the 2 books in the series that take place in the general time frame and geographic area. They are getting much more out of a novel format than workbook. These are a MUST for the upper grade school level. I've read them too! When we travel for field trips the girls take turns reading chapters in the back and we discuss- good road teaching tool. I grew up with these stories - all of those that were contemporary in 1957. The stories are a great foundation for growing in holiness and even at 69 years of age, I remember them clearly. Great investment for every family!